This recipe combines potato with the wonders of quinoa which makes a unique appetizer. 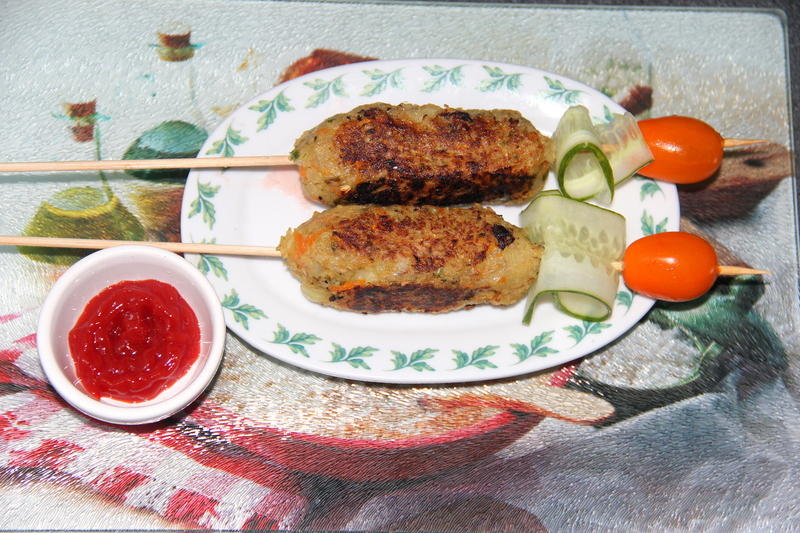 Kabab is just vegetables roasted/ grilled on a skewer; It may be served on plates in sandwiches. Try pairing then with soup/salad. It makes a great snack/nice side dish to the main meal. Heat oil in the non-stick pan; Add cumin seeds, onion, green chilli-garlic paste and saute for a minute. Add grated carrot, Quinoa, mashed potatoes and saute for 2-3minutes. Turn off the flame and allow it to cool down completely. Use skewers to roll them into long kababs or make bite sized kababs using toothpicks. Heat a pan/skillet and cook them on all sides on a hot tava with few drops of oil till golden brown. Serve hot with tomato sauce/mint chutney/salads. Bread can be crushed in the food processor. It can be rolled in skewers or just made to patties and cooked. This can be baked in the oven just after rolling on skewers place on the lined baking tray and bake at the pre-heated oven for 15-20minutes at 180deg c.
Posted on July 16, 2014, in Appetizers, Indian, International, Starters and tagged Chitras healthy kitchen, drchdiet food, Healthy vegetarian Kabab, Quinoa Kabab, Quinoa recipes, Vegetarian Kabab Healthy. Bookmark the permalink. 24 Comments. Thank you. ….glad you liked it…..
That sounds good for a barbecue ! That sounds like a very nice idea…. Love it! I have not tried combining potatoes and quinoa yet. Thank you Quick answer team to link my recipe.. Am honoured..